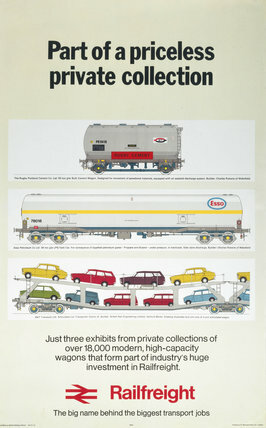 Poster produced for British Rail (BR) Railfreight, showing freight wagons used to transport road vehicles, cement and oil. Printed by St Michaels Pres Ltd, London. 'Cambridge - The 'Backs' in Springtime', BR (ER) poster, 1950. 'Highland Games', BR (ScR) poster, 1948-1965. 'Dunoon', BR (ScR) poster, c 1960s.